Carroll’s Ava Lickliter (11) goes up for a shot, during the first half of Monday’s Jan. 14 girls high school basketball game with Tippecanoe. Carroll won the nonleague contest, 56-39. 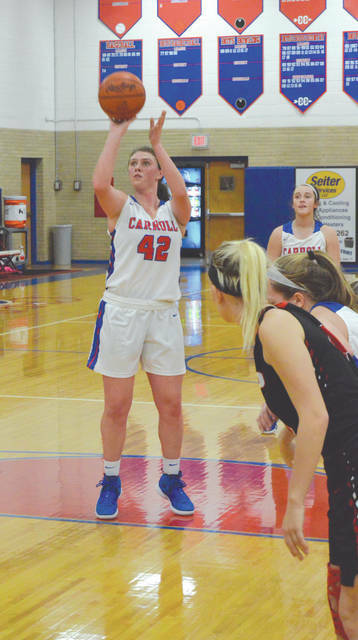 Elizabeth Bush (21) led the Carroll Patriots with a game-high 21 points in Monday’s Jan. 14 home win over Tippecanoe. 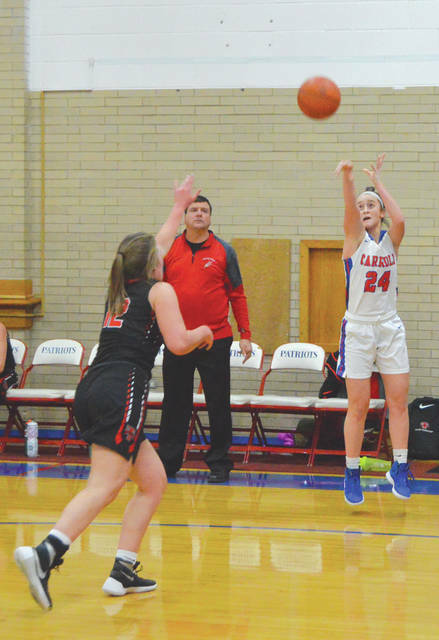 Carroll’s Allie Stefanek (24) hit both of the Patriots’ three-point shots in Monday’s 56-39 win over visiting Tippecanoe. Carroll’s Julia Keller puts up a free throw, during the first half of a girls high school basketball game with visiting Tippecanoe, Jan. 14, in Riverside. Keller scored 15 points in the Patriots win. 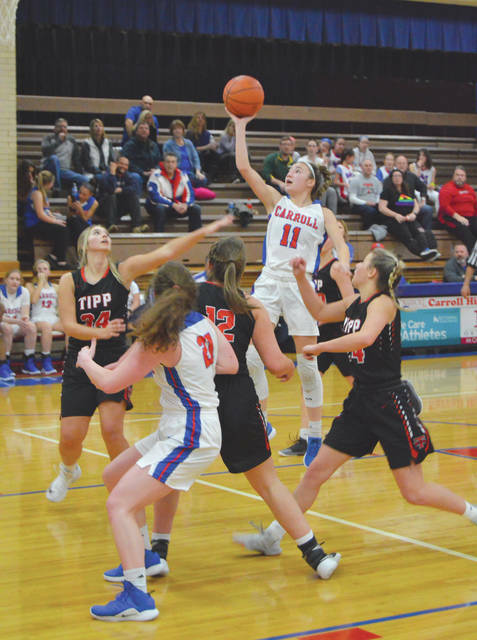 RIVERSIDE — A veteran Carroll team was tested early — and passed — against a solid, but youthful bunch from Tipp City Tippecanoe. 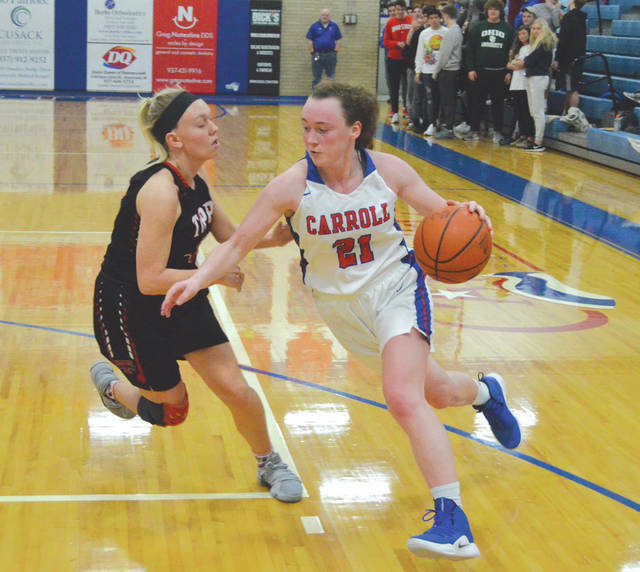 Carroll trailed to the Red Devils, 16-14, after a quarter of play, but the Patriots outscored Tippecanoe 42-25 the rest of the way, for a 56-39 win Jan. 14 at Carroll High School. Tippecanoe came into Monday’s contest as the leaders of the Greater Western Ohio Conference’s American North division with a 9-3 overall mark. The Red Devils are undefeated in the GWOC North at 7-0. They’d nearly doubled up a solid Fairborn team 58-32 in their last contest. All four of the team’s losses have come on the road, however, and Carroll’s full-court pressing defense left the Devils road weary once again. Liz Bush led Carroll with 21 points scored. Julia Keller, who entered the game ranked second in the entire Greater Catholic League Co-Ed with a 14.6 points-per-game scoring average, finished with 15. Rebounding was a bit of a factor as well. Both Keller and Bush were unofficially recorded with eight rebounds, and when Eve Thorner came in to give those regulars a breather, she snared four key offensive rebounds for the Patriots. Carroll remains undefeated with the win. The Patriots are now 14-0 with a home test against Greater Catholic League Co-Ed South leading Roger Bacon up next, at 7:30 p.m. Wednesday, Jan. 16. The Patriots will then participate in the Flyin’ To The Hoop basketball showcase event at 11:30 a.m. Saturday, Jan. 19 at Ketterings Trent Arena. Tickets for that event against Minster are on sale in the Carroll High School Athletic Office. Jillian Brown led Tippecanoe with 10 points scored. Sophomore Ashleigh Mader, the team’s leading scorer with a 10.6 points-per-game average, finished with seven, while sophomore Rachel Wildermuth and junior Kendall Clodfelter finished with six points each. Tippecanoe falls to 9-4 overall. They get back into GWOC action, but will return to Riverside, Wednesday, Jan. 16 for a 7:30 p.m. contest at Stebbins. Devils coach Andy Holderman says his youthful, but talented team will be better after taking on a tough Carroll team. “Absolutely. That’s why you schedule these games. I thought we played a pretty solid first quarter, but then they got us into a little bit of a hurry by changing the way we handled their pressure,” Holderman said. “And then we didn’t defend as well as we can, and things sorta went downhill from there.